Another aspect of these methods is that the statistical relationship is only valid for one water type and one seafloor type. Therefore, if an area contains different types such as coral, sediment, algae and rubble, the statistical relationship needs to be calculated for each of these substrate types. The correct formula then needs to be applied to each pixel in the image, i.e. the algorithm needs to be informed a-priori which substrate type it is encountering in that image pixel. This brings the problem full circle back to one of the fundamental challenges of satellite-derived bathymetry: how do you know whether a darker signal is due to deeper water, a darker substratum, or a bit of both? These methods can still be useful as they are relatively straightforward to implement (see The IHO-IOC GEBCO Cook Book, 2016). Physics-based methods on the other hand, do not require known depth information for the study area, and can therefore be applied independent of satellite data type and study area. These methods rely on fully describing the physical relationship between the measured light signal and the water column depth. Optical variability in the atmosphere and water column is accounted for within the algorithm inversion, and no 'tuning' to known depths is required. Therefore, an area which is physically inaccessible and for which there is no previous information known can be targeted. Not surprisingly, these physics-based methods require more sophisticated algorithms and powerful processing capacity. The benefit is that they typically prove to be more accurate, especially in areas with varying substrate types, turbidity and/or atmospheric conditions. This is of particular importance because only a small fraction of the sunlight recorded by the satellite’s sensor originates from the source that can be associated with water depth. Depending on the wavelength channel, this fraction varies typically between less than one and up to a maximum of 20%, going from near-infrared to green/blue light energy. It is critical to accurately account for the other sources of light energy in order to separate out the relevant water column depth contribution to the measured signal. The integration of SDB data into daily use can be straightforward if the bathymetric data quality and delivery formats follow best practice. Hence the file formats typically follow industry standards (OGC) and enable a direct use in current GIS or online visualisation tools through Web Mapping of Coverage (WMS, WCS) interfaces, hydrographic software or scripting tools. ISO conform metadata including important information on tidal corrections, processing levels and date and time of satellite recording are essential for geodata and are mandatory for all SDB data. Furthermore, it is important to understand the uncertainties in the data as well as the limitations of SDB for a given application in order to integrate the data appropriately. Such information needs to be expressed in uncertainty layers which should ideally include quantitative information. For some applications, such as safety of navigation, additional information such as the ability to identify obstructions of different sizes needs to be included as well. Satellite-derived Bathymetric information supports safety of navigation by providing up-to-date and high-resolution grids of the shallow-water zone. This is of particular importance in areas with outdated charts or dynamic seafloor. In addition to the bathymetric information, of particular importance is the identification of obstructions which could be a risk to navigation. Ideally the bathymetric data are provided in the form of digital nautical charts (ENCs) and ECDIS (Electronic Chart and Display System) as the main navigation device which represents the standard for the majority of vessels. Satellite-derived Bathymetry data cannot immediately be used for navigation with ECDIS – however, it can serve as an additional data source when updating the bathymetric information of nautical charts (paper or digital). ENC Bathymetry Plotter, a recently finished software product of SevenCs’ chart production suite, represents a powerful tool to create depth-related information objects for inclusion in ENCs which fulfill all relevant IHO quality standards. SevenCs and EOMAP have teamed together to provide an innovative service, the combination of up-to-date shallow water bathymetry provided as a standard ENC. This can therefore be used immediately on board vessels. An update of official ENCs which include Satellite-derived Bathymetric data, is therefore possible at the commencement of a voyage, but also during the vessel’s journey - via satellite communication - and therefore allows for the planning of more efficient shipping routes, increased safety as well as an improved situational awareness to react to a forced change of the shipping route (e.g. weather events or other threats). It is obvious that the need for updating ENCs for safety of navigation is of importance for poorly mapped areas. It should not be understood to replace recent, high-resolution and quality ENCs if available. In 2016, bathymetric data was provided to Van Oord covering several atolls in The Maldives. The data were used to enhance safe navigation by charting all shoals which might or might not be indicated on Electronic Navigation Charts. This contributed to efficient planning of the project’s activities. Data were provided within a few days of ordering covering an area of several hundred sq. km, which showcases the flexibility of the technique. Reconnaissance surveys are usually relevant for areas which are poorly surveyed, where charts are outdated or where bathymetric data are simply not accessible. Many examples for these kinds of applications have already been published and two showcases are summarised in the following paragraphs. In 2013, EOMAP mapped the shallow-water bathymetry of the entire Great Barrier Reef, Australia, at 30m grid resolution. This was the first depth map of its kind for the entire Great Barrier Reef, and also the largest optical SDB dataset ever made. In 2014, Shell published a paper on the use of EOMAP’s Satellite-derived Bathymetry (delivered at 2m grid resolution) to support their shallow-water seismic campaign in northwest Qatar (Siermann et al. 2014). Shell summarised the benefits of using the satellite techniques over more traditional methods by citing a 1 Million USD costs savings and very timely delivery of the data. 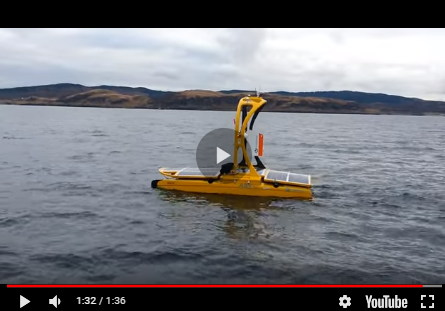 Hydrodynamic modelling exercises, such as generating tsunami forecast models, are typically not the type of applications with budgets that allow for purchasing bathymetric survey campaigns using more traditional methods. Commonly, very coarse resolution bathymetric grids such as GEBCO are used instead, but this has limited validity in coastal areas. By using Satellite-derived Bathymetry, shallow-water depth data can be derived at fit-for-purpose grid resolution to within a limited budget. As a standalone dataset it does not fulfil the modellers requirements but when merged with up-to-date information on the coastline – (also derived from the satellite imagery), survey and chart information, a seamless shoreline-to-deep-water dataset can be created, which greatly improves on currently available datasets. Such a dataset was created for the Gulf region, which now serves as bathymetric dataset for tsunami modelling in the area. Over the intermediate term it is expected that satellite-derived mapping of the seafloor will continue to be increasingly accepted and integrated as a survey tool - as is now already the case for a number of innovative user groups. Developments are still needed in areas such as how to best quantify uncertainties and small scale obstructions. One likely development will be the mutlitemporal and sensor agnostic mapping approach, which can be oversimplified as: use all available image data to the best possible extent and quality. With the advances of cloud computing, physics-based algorithms and an increasing selection of image data, this is would be a natural evolution for Satellite-derived Bathymetry. Siermann, J., Harvey, C., Morgan, G., Heege, T. (2014). Satellite derived Bathymetry and Digital Elevation Models (DEM); IPTC-17346. doi:10.2523/17346-MS.
Wettle M, Hartmann K (2014). ‘Un-mappable Great Barrier Reef finally mapped, 13 Nov 2013. Hartmann K, Heege T, Wettle M (2015) EOMAP provides shallow water bathymetry for the South China Sea, 16th July 2015. Geoconnexion. International Hydrographic Organization, Intergovernmental Oceanographic Commission, The IHO-IOC GEBCO Cook Book, IHO Publication B-11, Monaco, Dec. 2016, 429 pp - IOC Manuals and Guides 63, France, Dec. 2016, 429 pp).